It was only when I looked in detail at some of the pages on the website, www.doctorssupportgroup.com, that I realised there have been cases of suicide and cardiac illness in doctors that were probably directly or indirectly related to the stress that they suffered after being subject to investigations, suspension or dismissal. I repeat what I intimated earlier, namely that one cannot comment on the rights or wrongs of individual cases, and there are likely to be instances where doctors and other health professionals need to have action taken against them in the interests of patient safety, and even in their own interests. However, there are almost certainly cases of miscarriage of justice in many such instances, and that is a major focus of my campaign. I also at the same time came across some interesting articles, including one from the British Medical Journal in 2000 (Download BMJ article) that not only highlighted cases of distress and hardship in doctors who found themselves unjustly treated but also cited a campaign around that time by Baroness Jill Knight of the House of Lords to bring about some changes in the NHS system to make it fairer. So, what I am trying to achieve at the current time has echoes from a number of years ago. I have found out that my Remedy Hearing will now take place in April 2013. At that hearing, the judge will decide whether to ask the employer to give me my job back, what compensation I might receive, and whether one side or the other has to pay Costs. It is of course disappointing that I will have to wait a full year from the time of my original employment tribunal hearing to find out all of this, but c’est la vie. On Tuesday October 9, I attended a conference at the Royal Society of Medicine in London entitled, The Intoxication of Power: From Neuroscience to Hubris in Healthcare and Public Life. It was organized by Lord David Owen (who started his career as a doctor specialising in neurology) and his colleagues. It was an excellent meeting, and below you can see a photoshot that includes Lord Owen. Hubris generally refers to excessive pride and arrogance by those in power, usually with untoward consequences. For those of you who are interested, this is the seminal article on the subject by Lord Owen (Download hubris article). At the meeting, hubris was discussed in a number of domains of public life, including politics, healthcare, business and journalism. There were also scientific papers on how the concept of hubris related to concepts and findings in research on addiction, trust, and empathy. It was nice that Gandhi was mentioned by several speakers in the symposium. I was lucky enough to grab a few words with Lord Owen during the tea-break. I also managed to speak to my fellow Northern Irishman, Lord John Alderdice, who is both a politician and a psychiatrist by profession, and who was also a speaker at the meeting. 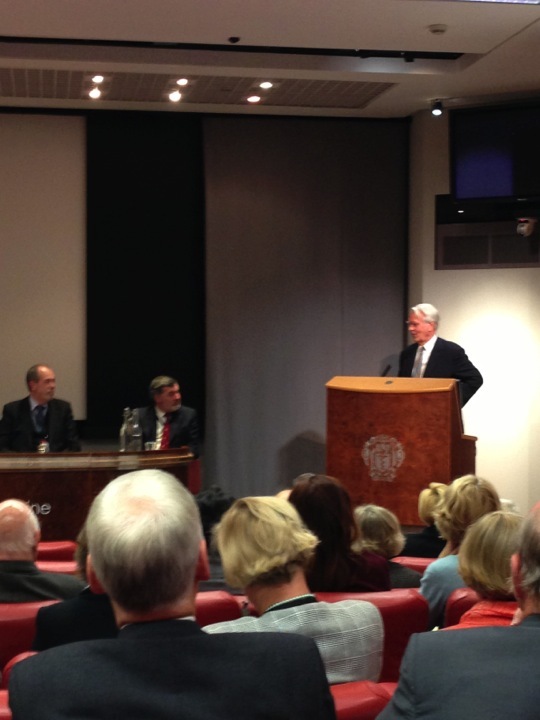 Symposium on Hubris at the Royal Society of Medicine, with Lord Owen at the lectern.